On the question of the logical content of Dr. Harding’s harangue of last Friday, I do not presume to have views. The matter has been debated at great length by the editorial writers of the republic, all of them experts in logic; moreover, I confess to being prejudiced. When a man arises publicly to argue that the United States entered the war because of a “concern for preserved civilization,” I can only snicker in a superior way and wonder why he isn’t holding down the chair of history in some American university. When he says that the United States has “never sought territorial aggrandizement through force,” the snicker arises to the virulence of a chuckle, and I turn to the first volume of Gen. Grant’s memoirs. And when, gaining momentum, he gravely informs the boobery that “ours is a constitutional freedom where the popular will is supreme, and minorities are sacredly protected,” then I abandon myself to a mirth that transcends, perhaps, the seemly. But when it comes to the style of a great man’s discourse, I can speak with a great deal less prejudice, and maybe with somewhat more competence, for I have earned most of my livelihood for twenty years past by translating the bad English of a multitude of authors into measurably better English. Thus qualified professionally, I rise to pay my small tribute to Dr. Harding. Setting aside a college professor or two and half a dozen dipsomaniacal newspaper reporters, he takes the first place in my Valhalla of literati. That is to say, he writes the worst English I have even encountered. It reminds me of a string of wet sponges; it reminds me of tattered washing on the line; it reminds me of stale bean soup, of college yells, of dogs barking idiotically through endless nights. It is so bad that a sort of grandeur creeps into it. It drags itself out of the dark abysm (I was about to write abscess!) of pish, and crawls insanely up the topmost pinnacle of posh. It is rumble and bumble. It is flap and doodle. It is balder and dash. But I grow lyrical. More scientifically, what is the matter with it? Why does it seem so flabby, so banal, so confused and childish, so stupidly at war with sense? If you had first read the inaugural address and then heard it intoned, as I did (at least in part), then you will perhaps arrive at an answer. That answer is very simple. When Dr. Harding prepares a speech he does not think of it in terms of an educated reader locked up in jail, but in terms of a great horde of stoneheads gathered around a stand. That is to say, the thing is always a stump speech; it is conceived as a stump speech and written as a stump speech. More, it is a stump speech addressed to the sort of audience that the speaker has been used to all of his life, to wit, an audience of small-town yokels, of low political serfs, or morons scarcely able to understand a word of more than two syllables, and wholly unable to pursue a logical idea for more than two centimeters. 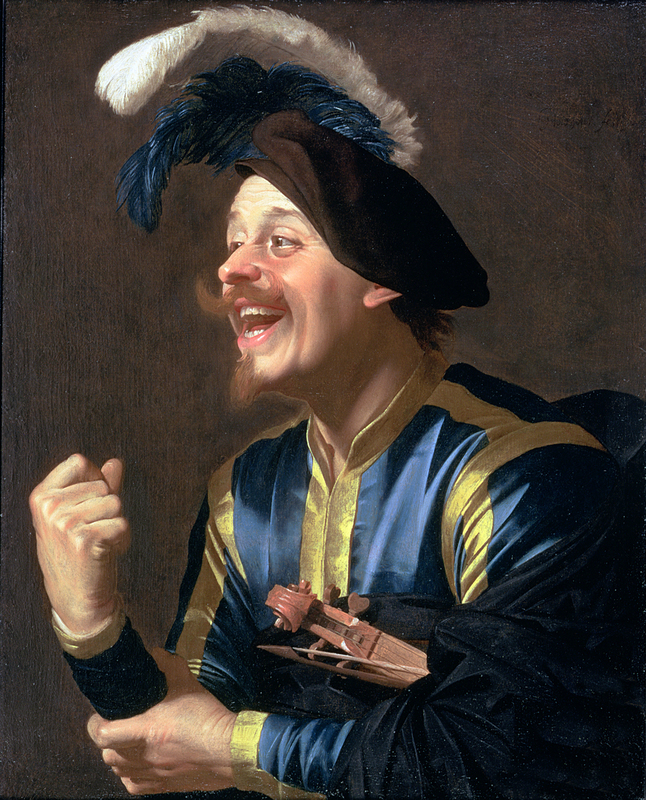 Portrait of a Laughing Violinist, by Gerrit van Honthorst, 1624. © Johnny van Haeften Ltd., London. The Bridgeman Art Library. Such imbeciles do not want ideas—that is, new ideas, ideas that are unfamiliar, ideas that challenge their attention. What they want is simply a gaudy series of platitudes, of sonorous nonsense driven home with gestures. As I say, they can’t understand many words of more than two syllables, but that is not saying that they do not esteem such words. On the contrary, they like them and demand them. The roll of incomprehensible polysyllables enchants them. They like phrases which thunder like salvos of artillery. Let that thunder sound, and they take all the rest on trust. If a sentence begins furiously and then peters out into fatuity, they are still satisfied. If a phrase has a punch in it, they do not ask that it also have a meaning. If a word slips off the tongue like a ship going down the ways, they are content and applaud it and wait for the next. Harding carries his stump manner into everything he writes. He is, perhaps, too old to learn a better way. He is, more likely, too discreet to experiment. The stump speech, put into cold type, maketh the judicious to grieve. But roared from an actual stump, with arms flying and eyes flashing and the old flag overhead, it is certainly and brilliantly effective. Read the inaugural address, and it will gag you. But hear it recited through a sound magnifier, with grand gestures to ram home its periods, and you will begin to understand it. Let us turn to a specific example. I exhume a sentence from the latter half of the eminent orator’s discourse: “I would like government to do all it can to mitigate, then, in understanding, in mutuality of interest, in concern for the common good, our tasks will be solved.” I assume that you have read it. I also assume that you set it down as idiotic—a series of words without sense. You are quite right; it is. But now imagine it intoned as it were designed to be intoned. Imagine the slow tempo of a public speech. Imagine the stately unrolling of the first clause, the delicate pause upon the word then—and then the loud discharge of the phrase in understanding, in mutuality of interest, in concern for the common good, each with its attendant glare and roll of the eyes, each with a sublime heave, each with its gesture of a blacksmith bringing down his sledge upon an egg—imagine all this, and then ask yourself where you have got. You have got, in brief, to a point where you don’t know what it is all about. You hear and applaud the phrases, but their connection has already escaped you. And so, when in violation of all sequence and logic, the final phrase, our tasks will be solved, assaults you, you do not notice its disharmony—all you notice is that, if this or that, already forgotten, is done, “our tasks will be solved.” Whereupon, glad of the assurance and thrilled by the vast gestures that drive it home, you give a cheer. There is nothing sillier than a silly laugh. That is, if you are the sort of man who goes to political meetings, which is to say, if you are the sort of man that Dr. Harding is used to talking to, which is to say, if you are a jackass. The whole inaugural address reeked with just such nonsense. The thing started off with an error in English in its very first sentence—the confusion of pronouns in the one-he combination, so beloved of bad newspaper reporters. It bristled with words misused: civic for civil, luring for alluring, womanhood for women, referendum for reference, even task for problem. “The task is to be solved”—what could be worse? Yet I find it twice. “The expressed views of world opinion”—what irritating tautology! “The expressed conscience of progress”—what on earth does it mean? “This is not selfishness, it is sanctity”—what intelligible idea do you get out of that? “I know that Congress and the administration will favor every wise government policy to aid the resumption and encourage continued progress”—the resumption of what? “Service is the supreme commitment of life”—ach, du heiliger! But is such bosh out of place in stump speech? Obviously not. It is precisely and thoroughly in place of stump speech. A tight fabric of ideas would weary and exasperate the audience; what it wants is a simple loud burble of words, a procession of phrases that roar, a series of whoops. This is what it got in the inaugural address of the Hon. Warren Gamaliel Harding. And this is what it will get for four long years—unless God sends a miracle and the corruptible puts on incorruption…Almost I long for the sweeter song, the rubber stamps of more familiar design, the gentler and more seemly bosh of the late Woodrow. “Gamalielese.” Running on a promise to “return to normalcy,” Warren G. Harding won the presidential election, the first in which women could vote, with the greatest margin of victory in the popular vote up to that time. Mencken began writing and editing for the Sun papers in 1906, an association that lasted, with some interruptions, for more than forty years, while also publishing Notes on Democracy in 1926, Treatise on the Gods in 1930, and Treatise on Right and Wrong in 1934. He died at the age of seventy-five in 1956.